Washington, D.C., 24 August 2018 (PAHO/WHO)- While 34 Member States of the Pan American Health Organization (PAHO) remain measles free, endemic transmission of the virus has now been reestablished in Venezuela. 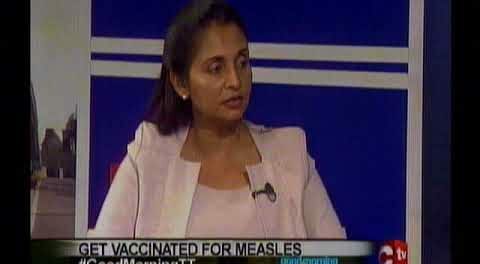 To stop further spread of measles throughout the region, the Director of PAHO, Carissa F. Etienne, has urged all countries to rapidly increase vaccination coverage. Measles circulation in other regions of the world has always represented an ongoing threat to the Americas, as imported cases can reintroduce the virus among unvaccinated individuals. In 2017, there were 149,142 cases of measles reported globally, with the Americas accounting for just 0.6% of all cases. In July 2017, Venezuela reported the first cases of this current measles outbreak and confirmed that this outbreak was due to a virus strain that was originally reported in Asia and later in Europe. In 2018 as of 20 August, Venezuela has reported 3545 confirmed cases of measles, including 62 deaths. A further ten countries in the region have reported a total of 1459 confirmed cases and six deaths. In the Americas, coverage rates for the first dose of measles, mumps and rubella (MMR) vaccine are currently less than 95%. In addition, lower immunization coverage has been observed in some municipalities and in specific settlements. Vaccination coverage rates for children age 5 years and under must be 95% or greater among all populations in order to maintain elimination. PAHO and its partner agencies have been working with Venezuela to increase vaccination coverage, strengthen epidemiological surveillance and interrupt transmission. The organization has also mobilized financial resources to support the purchase of vaccines, other supplies and technical cooperation activities to help Venezuela and other affected countries halt the spread of measles. In 2016, the Region of the Americas became the first in the world to obtain the measles elimination certification, following years of concerted efforts to vaccinate children. A majority of countries in the Americas Region reported their last endemic cases more than 18 years ago. However, the fact that a disease has been eliminated does not mean that it no longer exists, it simply means that it does not circulate in a specific area. A country is no longer considered to be measles free when the same type of virus has been circulating for more than 12 continuous months. The recurrence of endemic circulation of measles virus, as well as current outbreaks, is evidence of existing gaps in vaccination coverage, which must be urgently addressed. The Pan American Health Organization (PAHO) works with the countries of the Americas to improve the health and quality of life of their populations. Founded in 1902, it is the world’s oldest international public health agency. It serves as the Regional Office of WHO for the Americas and is the specialized health agency of the Inter-American system.